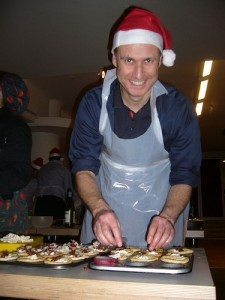 Just before I went on my holidays we ran another of our Christmas Corporate Cooking events in the heart of London, Piccadilly. Another very successful evening which everybody enjoyed! This group were very keen on impressing our chef with their presentational skills and they certainly did impress us. The food looked and tasted very nice and the mulled wine was enjoyed by all. After an evening of preparing and cooking, eating and drinking the group then went on the enjoy the rest of their Christmas Party in the city and it was then our job to tidy up and pack away, never as much fun as running the event but we now have this down to a fine art so didn’t take us too long. After a lovely week off over Christmas it is now back to work and feels like Christmas was already such a long time ago! Hope everyone had a lovely Christmas and a Happy New Year to you all and we look forward to running many events in 2009!